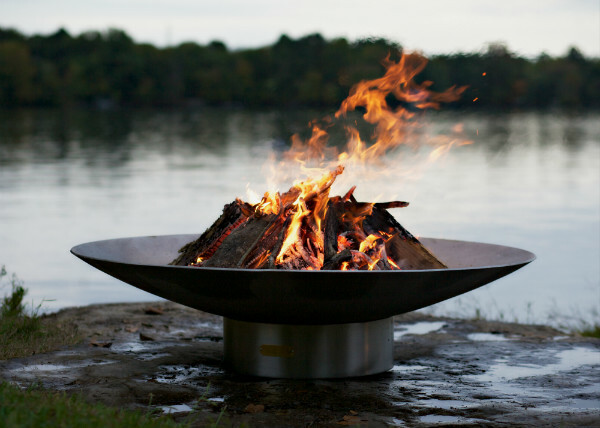 The top tips you need to know to keep your fire pit burning for years to come! Fire pits are a great investment that will bring you and your loved ones years of enjoyment if you learn how to take care of them properly. Luckily, maintaining your fire pit is easy and doesn’t require a lot of time or hard work! Be aware of your surroundings: Only use your fire pit outside in an open space with plenty of air flow. Never place your fire pit under trees, low-hanging plants, or near anything flammable. Read more on this topic here and here. Read the owner’s manual thoroughly so you know how to use and take care of your fire pit properly. Always maintain the recommended clearance to combustibles. Never use accelerants such as gasoline, lighter fluid, alcohol, or other volatile liquids to start a fire. Accelerants are very dangerous and can damage your fire pit. Don’t use plastic materials in or around your fire pit. Melted plastic is extremely difficult to remove and will ruin the fire pit’s surface. Burning plastic also releases toxic fumes into the air. Always keep water or a fire extinguisher close by in case of emergency. Cover your fire pit when it’s not in use. Covers prevent water, dirt, and debris from collecting inside the burning area, and will prevent unnecessary wear and tear from inclement weather conditions. Allow the fire pit to cool completely before covering it. If you live in a region with harsh winters, it’s best to store your fire pit in a dry, sheltered area to keep it in proper working order. Never leave your fire pit on unattended and always make sure children are supervised and kept a safe distance away from the fire at all times. To clean your fire pit, follow the instructions in the owner’s manual. Generally, you can use a soft cloth and mild soapy water to clean the surface and outside of the fire pit. Avoid harsh chemicals and cleaning agents, unless otherwise approved by the manufacturer. Fire pits should never be used in an enclosed space. If not properly ventilated, a fire pit will cause a buildup of toxic smoke and harmful gases, like carbon monoxide. Always use a fire pit in an open space with plenty of air flow. Only use dry, split wood to fuel the fire. Avoid using pressure-treated wood. Burning pressure-treated wood releases toxins and chemicals into the air that are harmful to your health and the environment. Use small pieces of kindling such as leaves and twigs, or a natural fire starter like Fatwood, to get the fire going. Use a spark screen to prevent sparks and embers from flying out. Avoid extinguishing a fire with water. Allow it to burn out naturally. The rapid change in temperature will cause your fire pit to weaken or crack. If you’re in a hurry, you can use sand to extinguish the flames. Sand will smother the fire and won’t affect the surface of your fire pit. Make sure to clean the sand out before using your fire pit again. Allow ashes to cool overnight by spreading them out in a thin layer over the fire pit’s surface. Remove the ashes the next day using a metal shovel and place them into a metal bucket with a secure lid. Ashes can stay hot for a while, so having a metal bucket with a secure lid will prevent them from scattering around and possibly igniting a fire. If you’re using a cooking grate to prepare food over your wood burning fire pit, always clean up properly to avoid a build up of residue on and around the fire pit and cooking grate. Before each use, make sure there aren’t any combustible materials and flammable liquids close by. Regularly inspect the burner, gas lines, connections, hoses, and fittings to make sure they are tight, secure, and clean. Keep the vent openings and surrounding areas free and clear of dirt and debris at all times. Bugs, dirt, and buildup can block the flow of gas and cause a fire. Have the fire pit and gas supply inspected once a year by a licensed professional. Any maintenance needed must be done by a qualified service technician. Don’t burn solid fuels, like leaves, sticks, wood, paper, plastic, trash, or food in a gas fire pit. These items will damage the fire pit and burner and can lead to an uncontrollable fire. Never cook over a gas fire pit. Falling food and residue will damage the burner, which can be difficult and expensive to replace. Soot and dirt can accumulate on the burner and media ( gas logs, lava rock, fire glass, etc.). Check them regularly and follow the cleaning instructions in your owner’s manual to clean off any buildup. Make sure the fire pit has cooled completely and the gas supply is turned off before starting the cleaning process. If there is standing water in the fire pit or the media is wet, drain the water out and let it dry completely before using the fire pit. 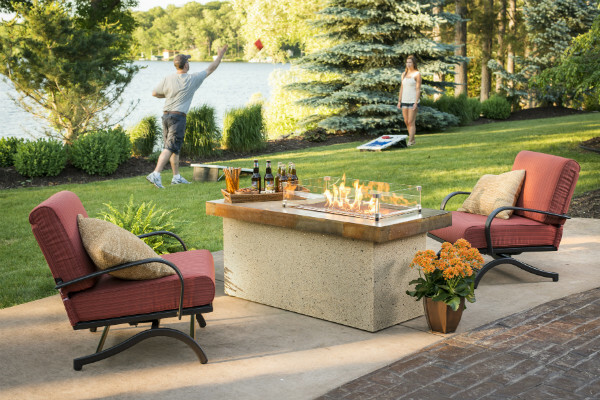 Now that you have some insight into fire pit maintenance and safety, we hope you can spend more time relaxing around the fire pit with your loved ones and less time worrying about its upkeep! Is it safe to put a fire pit under your covered patio? Here's what you need to know. 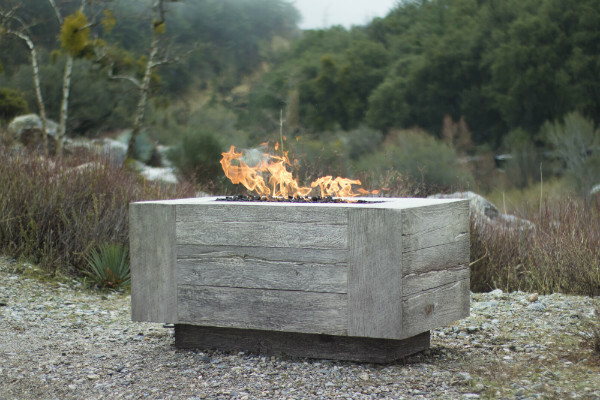 Check out our top 5 most unique fire pit finds! Explore this gorgeous customer spotlight featuring Kingsman Fire Bowls!